A review copy was received from the publisher. This does not affect the contents of my review and all opinions are my own. If you are a fan of Star Wars, especially the animated The Clone Wars TV series, then Star Wars: Ahsoka is certainly not to be missed. While that show may have ended a couple years ago, many were surprised when Anakin Skywalker’s young Padawan Ahsoka Tano, who left the Jedi Order near the end of the Clone Wars, suddenly resurfaced again in the current run of Star Wars: Rebels. This Ahsoka is older, wiser, and carries a lot more scars. What exactly happened to her during those mysterious intervening years? How did she survive the Jedi slaughter following the execution of Order 66? What led her to join the Rebel Alliance’s fight against the Empire? I was excited to read this book in the hopes that it provide some insights into these questions, and I was not disappointed. I was also fortunate enough to receive the audio edition of Star Wars: Ahsoka for review. With their high production values, sound effects, and music, Star Wars audiobooks are always a treat, but I have to say the very best part of this one is the narrator, Ashley Eckstein, who was also the voice actress for the Ahsoka on The Clone Wars and Rebels. If you’re on the fence about giving the audiobook version a try, this might end up being the deciding factor. Personally speaking, I thought that listening to Ms. Eckstein read the book gave my experience that extra little “coolness” boost, almost like I was listening to Ahsoka tell her own tale. The story begins on Empire Day a few years after the end of Revenge of the Sith, where we find Ahsoka hiding out on the planet Thabeska under her new assumed name, “Ashla”. When circumstances force her to go on the run again, she decides to head for the remote moon of Raada, home to a rustic farming community. Here, Ahsoka hopes to continue eking out a quiet and simple life for herself, working as a mechanic. However, that peace is about to be shattered. Thanks to its rich soils and resources, Raada has suddenly come to the attention of the Empire, and the Imperial Navy has moved in to take over the agricultural industry. Needless to say, the locals aren’t too happy with this. The Empire is only interested in quantity over quality, and their crops are destroying the moon and the future of its citizens. 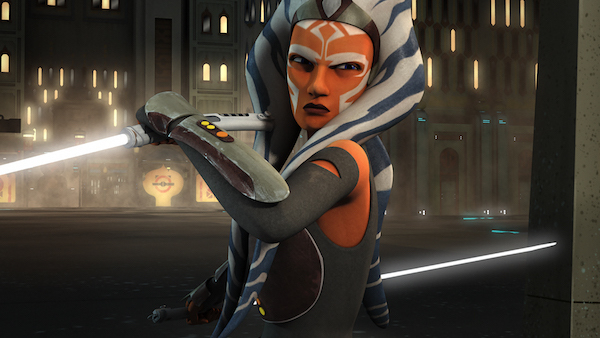 Against her original plans, Ahsoka finds herself unexpectedly pulled into Raada’s rebellion. The new friends she has made are humble farmers, full of anger towards the Empire but inexperienced when it comes to fighting. To prevent any more people from being hurt or killed, Ahsoka decides to help them put together a more organized resistance. Star Wars: Ahsoka can be enjoyed by anyone, even if you only have a slight familiarity with anything to do with Star Wars, but obviously readers who already have a good knowledge of the character and her roles in the two shows will find it a lot more interesting and emotionally impactful. E.K. Johnston made her story accessible to new readers, but there are also a lot of references and flashbacks to past events—many of which were from The Clone Wars—which will no doubt appeal to fans of Ahsoka. 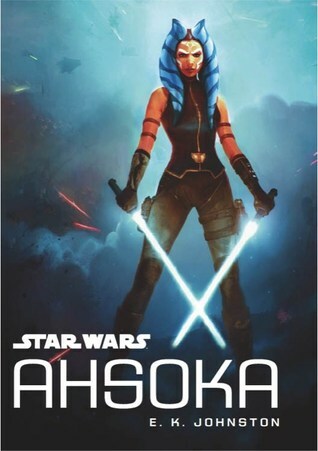 I imagine writing a Star Wars novel is no small task, especially when you’re tackling such an important and popular character like Ahsoka, but I thought Johnston did a fantastic job. Her writing and storytelling remained true to the Star Wars universe and the protagonist’s personality, detailing the thoughts and actions of the young Togruta. The former student of Anakin Skywalker has come into her own, and even though the Clone Wars has hardened and matured her, she still retains all of her courage and hopeful optimism. With regards to the story, I felt there were some mild pacing issues, namely at the beginning and at the end of the book. The energy in the first few chapters was definitely a bit on the sluggish side, owing to the fact that the main conflict took too long to be introduced. This is understandable in some ways, since the setting as well as characters have to be established, and Ahsoka herself was trying to keep a low profile. After the first quarter of the book though, the plot’s pacing noticeably picks up. The reader’s patience pays off as the action and excitement gradually builds to an amazing climax. After this point, I actually wished there had been more to the finale! I won’t deny that the ending felt rushed and that the book could have been longer, but those complaints aside, I had an amazingly good time with this novel. But of course, the biggest reason why you should read this book is all the wonderful and significant moments we get to see involving Ahsoka. We learn how she reestablishes contact with Bail Organa and joins the resistance, earning the codename Fulcrum. We also find out how she obtains her new set of white lightsabers, not to mention the fascinating new lore surrounding Force-attuned crystals. All that being said, if you are relatively new to the wider world of the Star Wars universe, you can certainly still enjoy this novel for what it is—but I probably wouldn’t recommend starting here. This book feels first and foremost like it was written for an audience already familiar with Ahsoka. Johnston clearly knows and loves the character, and delights in sharing that love with her readers by giving plenty of nods to events that happened in episodes of The Clone Wars. Even if you haven’t seen the TV series you will have a great time, but for fans of the show, it’s the little moments like that which will give you an extra thrill. Needless to say, if you love The Clone Wars and Rebels, this is an absolute must-read, and you will get a well-written and entertaining story as well. Additional Audiobook Comments: Other than stating how awesome it is that Ashley Eckstein is the narrator for this? She’s also amazing with voices and the fact that she voiced Ahsoka in the shows gave this audiobook an additional layer of immersion. She’s no stranger to voice acting, and her talent shines through in this performance. that’s great for the fans of the series, that’s for sure! Definitely worth it to hear Ashley read! Glad you enjoyed it – it’s probably not one I will pick up but I have to say I love the cover! Have you seen The Clone Wars? I would say the show is even better than some of the movies *cough* prequels *cough*. haaaa I really have to watch the animated SW series !! How can I find it on web? Want to try it!